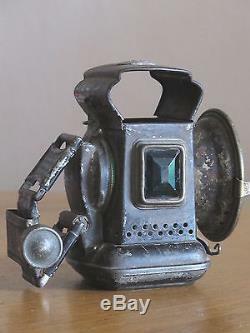 What we have here is an antique Jos Lucas Ltd (Joseph Lucas) Birmingham Company Victorian "Kinglet" Bicycle lamp. 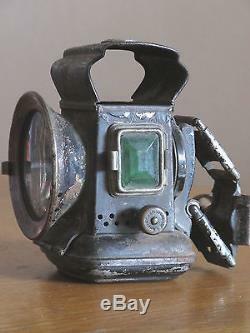 And while dating back to c1886 & representing a piece of British cycle history, the Kinglet was one of the first bicycle lamps made which was designed to work using kerosene/petrol and featured red & green cut glass panels. 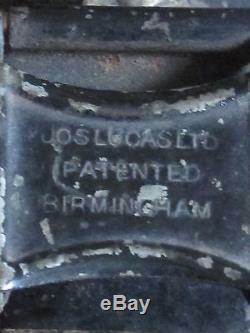 On the back the lamp is stamped Jos Lucas patented Birmingham. On the top, their is a metal plaque bearing the makers crest. On the inside the wick is still present. As for the cosmetic condition. The lamp is in very good condition considering it's age and appears to be complete with all the glass being present with some scratches. 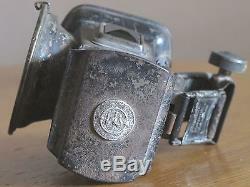 In addition, it is showing age related wear & tear with some paint removal, rust and tarnish on the casing. The thumb & wick screws are turning and operating as they should and all of the latches are present and working. And as such, I'd rate it as 7/10 for age. However, due to it's age and nature, I have not tested the item using fuel. 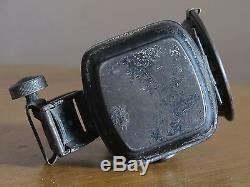 Furthermore, this item will be boxed & well packed to insure it arrives to you in as described condition. 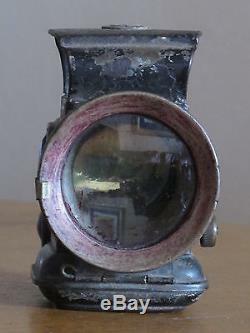 Measures: 11.5cms (H) X 7.5cms (D) X 12.5 (L). Free UK postal costs signed & posted within 24hrs. Please Note: immediate payments preferred unless by prior arrangement. Feel free to check out my other items. The item "JOSEPH LUCUS BIRMINGHAM VICTORIAN BICYCLE OIL LAMP RED & GREEN SIDES C1886 VGC" is in sale since Monday, September 15, 2014. 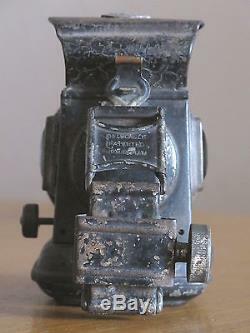 This item is in the category "Collectables\Tools & Collectable Hardware\Other Tools & Hardware". The seller is "surfingrainbows" and is located in London. This item can be shipped to North, South, or Latin America, all countries in Europe, all countries in continental Asia, Australia.